One of the nice things about having a well-seasoned Airstream (that’s a euphemism for “older”) is that I get to upgrade things (that’s a euphemism for “get new toys”) using either repairs or “testing” as the excuse. For years I’ve wanted a really nice inverter so that we’d have AC power for things like Eleanor’s coffee maker when we are boondocking, and this week we finally got one. An inverter, for those who aren’t sure, is simply a device that turns the battery power (12 volt DC) into the type of power you’d get from a plug in your home (120 volt AC). Garden-variety inverters that plug into cigarette lighter sockets are pretty cheap and we already had one of those, but they aren’t great. Instead of producing nice clean smooth electrical current, they produce a sort of choppy electricity that makes some appliances hum and buzz. The TV and the chargers for our Macbooks particularly don’t like it. Moreover, the plug-in inverter we have been using isn’t powerful enough. It is rated to produce 300 watts of power, which is plenty for the TV, but hopeless for something like a coffee maker, stick blender, hand mixer, toaster, vacuum, or microwave—all of which we have in our Airstream. So my dream was the ultimate: a “whole house” inverter capable of producing 2,000 watts of utility-grade power at every outlet in the Airstream. Not only would we be able to recharge myriad AC devices (Nintendo game, electric toothbrush, camera batteries, cordless drill, etc) but would be able to—oh miracle of miracles—warm up leftovers in the microwave. You might think that’s a joke, but I love eating leftovers of the things Eleanor makes. It has always been one of the great tragedies of our camping style that I can’t do that when we are off-grid. When I was at the annual RV industry convention a few weeks ago the guys at the Xantrex booth told me about their new product, the Xantrex Freedom HFS Inverter/Charger. They shipped me one for evaluation and I couldn’t wait to get it installed in the Airstream. Problem was, I felt the installation was a bit beyond my abilities. I had no trouble installing their Xantrex TrueCharge2 last April but the inverter required making some really huge cables and doing other things that I didn’t have tools for, so this time I opted to take it to Quartzsite to go see Solar Bill. We last visited Solar Bill in January 2010, to have a big Lifeline 4D battery installed. These days he’s across the street from where he used to be, but Bill is still the same friendly and chatty guy he ever was, still happily installing solar panels, charging systems, battery banks, and similar stuff after 37 years in the business. The installation was pretty smooth, and Bill’s tech was pretty impressed with the Xantrex HFS (he hadn’t seen one before because it’s a new product). We put it in the front storage compartment next to the battery, because you always want the shortest possible DC wiring run from the battery to an inverter. Our first test was a failure. I turned on the inverter, fired up the microwave, and everything was fine for about 10 seconds. Then the battery faded and the inverter shut off. Turns out our battery was just not up to the task, after six years of use. Time for a replacement. They didn’t have any Lifeline 4D (or equivalent) batteries in stock and we were itching to get to Death Valley, so I decided to upgrade to the Lifeline 8D. It’s not twice the battery as the name implies, it’s about 20% more capacity. Also 20% more weight, bulk, and cost. Our front compartment is now carrying 165 pounds of battery, but don’t worry, it’s still not overloaded. The battery sits atop a very sturdy part of the frame and since we aren’t carrying anything in the original battery box (which is mounted further forward on the A-frame) the net impact on tongue weight compared to the original spec is minimal. If this sounds like gobble-gook, just trust me, it’s fine. The upshot is that now we can run laptops, kitchen appliances, and yes even the microwave oven when we don’t have an electrical hookup. It’s amazingly cool. In fact, the microwave oven runs better than it usually does on campground power. That’s because the Xantrex HFS produces a perfect 120 volts all the time, whereas we usually find campground power sags to 114-116 volts under load. Of course there’s a price to be paid for this convenience. Making a pot of coffee requires about 5% of our usable battery capacity. Running the microwave really burns the electrons at the rate of about 2% of our battery every minute. So we have to be judicious about how much of this luxury we enjoy. The inverter just got put to the test. We headed to Death Valley for four nights to camp, completely free of hookups, with our friends Kyle, Mary, and Kathryn. Besides being a great trip, it was the perfect environment for an inverter. We ran nearly every AC device we have, and recharged the batteries daily from the sun. At the end of the four days, we still had 69% of our usable battery capacity left. We’re now heading to the Los Angeles area, where we’ll boondock for another three days by the beach. So far I’m impressed with the Xantrex, but I’ll put my full report in an upcoming article at Outside Interests. Watt a story. Electrifying. We are, however, shocked at the absence of the new Dometic performance rating. Hi Rich, I enjoy your “Man in the Maze” blog very much. And I enjoy Airstream Life very much. Your piece above about the inverter install made we wonder. Wouldn’t a good old fashioned clunky generator do the same job? Same same with a more expensive and less reliable solar panel. I guy deserves good leftovers, but the high cost inverter will draw down you big battery and you will be left with your propane stove once again. Like you said, this inverter install is a test evaluation. Let us know what you think. Looking forward to your trip adventures. David, those are good questions and they deserve a longer answer than I can do here. I’ll try to address them in a future blog. The short answer is that we made the decision to stop using a generator and go to solar for many reasons, long ago. For our camping style a generator just isn’t the best choice. So the inverter-battery-solar panel combination works best for us. But for other people, a generator might make more sense. Great treatment on an interesting topic, Rich. 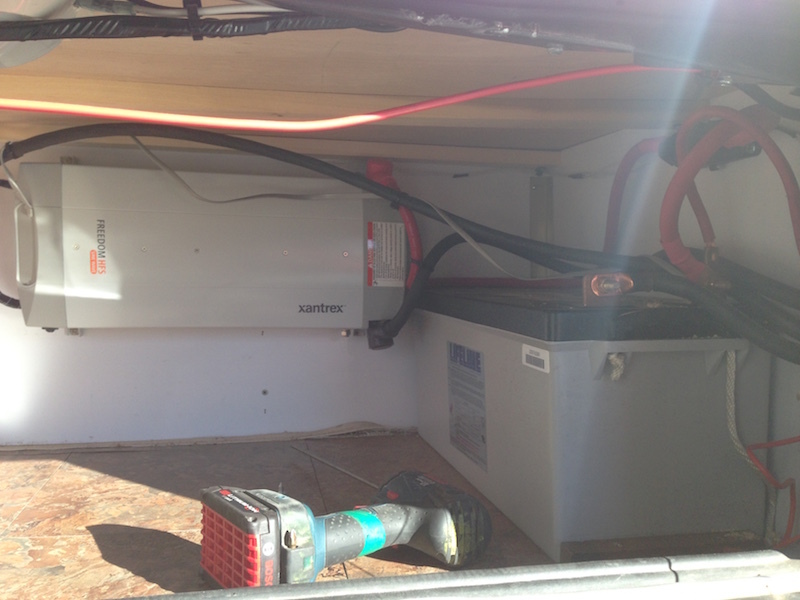 We’ve traveled with folks with whole house inverters. They love em, can zap leftovers or instant foods easily. Simplest benefit seems the availability of power at every outlet. Thanks for the clear explanation of your upgrade process.